A Foodie Bibliophile in Wanderlust: Pinterest is my new food muse: Crunchy Black Bean and Kale Tacos - a meatless recipe for meat-lovers! 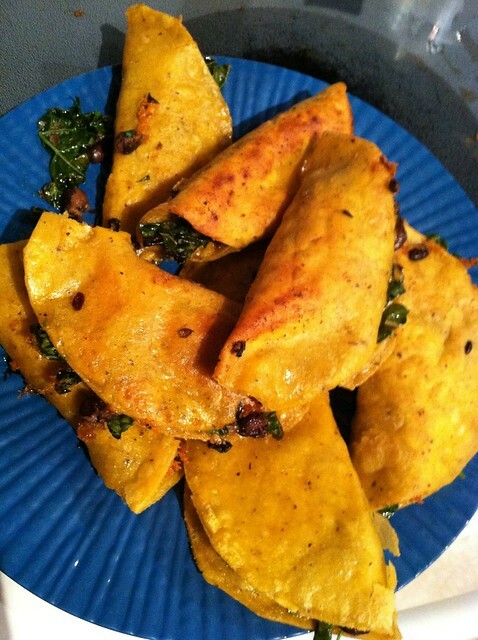 Pinterest is my new food muse: Crunchy Black Bean and Kale Tacos - a meatless recipe for meat-lovers! By now I'm sure most of you have heard of the wonder that is Pinterest, but if you haven't, let me tell you what a thing of beauty it is: a place to "pin" all of you ideas and inspiration on different boards to keep them organized. My newest muse in the kitchen has been gleaning ideas for meals from Pinterest and I have to give a huge shout out to the food blog Endless Simmer for giving me the inspiration for this recipe. In fact, the recipe is mainly theirs, with one thing added that was my idea. So it started with their recipe for Crunchy Black Bean Tacos. I have said for a long time on this blog that I am a hearty carnivore who wishes she had the will-power to be a vegetarian, for ethical and health reasons. So I am ALWAYS looking for recipes that use vegetables with meaty tastes and textures to replace the meat rather than using unsatisfying meat substitutes. When I saw this recipe for black bean tacos, it looked like a great meat replacement sort of dish, but I thought an even better way to amp up the meaty texture would be to add some sauteed kale to the mix. So here is my version of Endless Simmer's Crunchy Black Bean Tacos. I'm not lying when I say these tacos were BETTER than any meat taco I've ever had. This coming from the meat-lover over here. Strip kale of center stems and rinse and dry thoroughly. Chop into large, bite-sized pieces (keep in mind kale shrinks down quite a bit when you saute it). Heat a large, non-stick or cast iron skillet with 1 tablespoon olive oil and add minced garlic. When garlic starts to become fragrant, add the kale and saute until it wilts, stirring frequently so as not to burn the garlic. 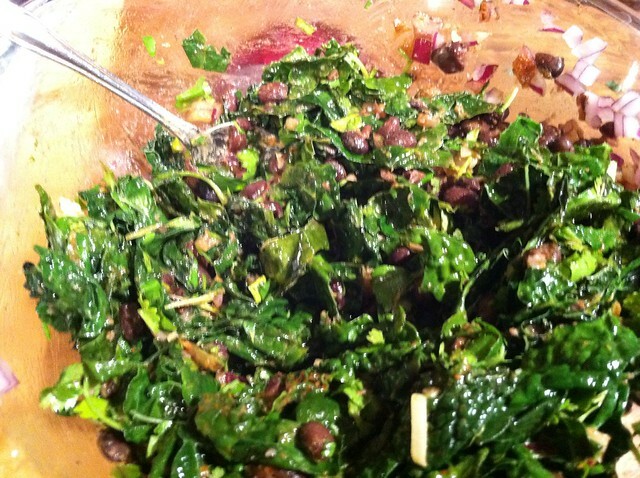 While the kale is wilting, in a large bowl, add black beans, onion, cilantro, cumin, paprika, salt, and pepper, stir to combine and lightly mash ingredients. When kale is done wilting, add to bowl and stir to combine. Using the same skillet you wilted the kale in, add remaining olive oil (use more if it is not enough to coat the entire bottom of the skillet) and put over medium-high heat. Put each tortilla in the hot oil for a few seconds before adding the black bean filling on one side of the tortilla and then top it with cheese. When the tortilla is pliable, fold over with a spatula and crisp on both sides. Top with any variety of condiments you prefer such as salsa, sour cream, hot sauce, guacamole, etc. I daresay that this dish will satisfy any meat-lover. Even my husband, who thinks that a meal isn't complete without some sort of meat involved, agreed that they had a nice, meaty texture. I don't think, however, he agreed that they were BETTER than a taco with meat in it - that was all me. I adore kale, but it has to be cooked. Raw kale is just too bitter and chewy for my tastes. Ooo, these look good. Will definitely try them. Both my mom and I are vegetarians. I love black beans and these look fabulous. I'm pinning this one too! Why haven't I thought to add a Recipe board at Pinterest? Thank you for sharing this great recipe. We eat a lot of tacos at my house in Texas! Here's my first ever Weekend Cooking: Paris in July. Hope you will stop by! We liked kale, I just forget to buy it when I go shopping. I'd love the kale in a taco, they look amazing! I love Endless Simmer. I love how honest they are about food and cooking. Great looking tacos. I have seen Kale at the markets, but it definitely is not available in our normal supermarkets here, unless it is called something else, which is entirely possible! This sounds fantastic. I haven't yet added kale to anything - been a little scared for some reason, but this sounds like the perfect way to start off. This looks like a great alternative to the traditional meat taco. Thanks for sharing! Wow - those look delicious! I am a carnivore, too, but this sounds like a great meat-substitute for those days when you're determined to be healthy. I don't have any kale in the house... hmm... may just have to go out and get some! Thanks for sharing! We love kale and black beans and tacos ... so this would be a hit for me. We eat vegetarian quite often but not exclusively. Sorry it took me so long to visit your post. I was out of town and didn't have Internet access.